From the North — Take US-23 South, to the Plymouth Road exit (#41). Turn right and follow Plymouth Road approximately 2 miles until you reach Maiden Lane and turn left. (This is the light immediately after Broadway Blvd., with a florist shop on the near left corner.) Continue on Maiden Lane. As you approach the next traffic light, use the center lane to cross Fuller Road. 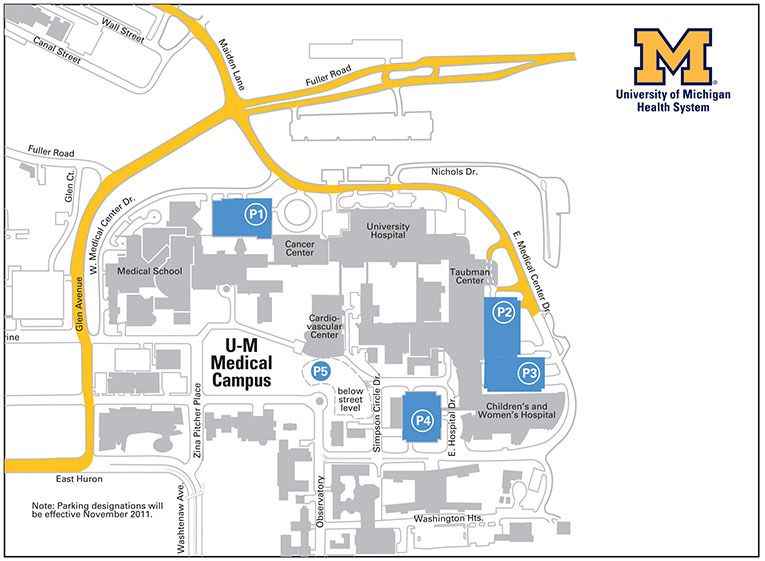 Maiden Lane changes to East Medical Center Dr. as you enter the campus. From the South — Take US-23 North to the Washtenaw Ave./BR23 exit (#37B) toward Ann Arbor. Merge onto Washtenaw Ave. and follow it approximately 1 mile until you reach Huron Parkway. Turn left at the second stop light at Fuller Road. As you continue on Fuller, you will pass the Veterans Hospital and be able to see the Health System campus on the hill to your left. At the traffic light at Fuller and Maiden Lane/ East Medical Center Drive, turn left. From the East — Take I-94 West to US-23 North (exit 180B). Take the Washtenaw Ave./BR23 exit (#37B) toward Ann Arbor. Merge onto Washtenaw Ave. and follow it approximately 1 mile until you reach Huron Parkway and turn right. When you reach the second traffic light, turn left onto Fuller Road. As you continue on Fuller, you will pass the Veterans Hospital and be able to see the Health System campus on the hill to your left. At the traffic light at Fuller and Maiden Lane/ East Medical Center Drive, turn left. From the West — Take I-94 east to Ann Arbor (exit 172). This merges into Jackson Rd. (Eastbound). Remain on Jackson, which becomes Huron, and continue for 2.5 miles through downtown. At the traffic light at Glen and Huron, turn left onto Glen. Go straight through 3 stop lights on Glen. At the fouth stop light, turn right onto East Medical Center Drive. The valet parking and patient drop off loop is located on the right side of East Medical Center Dr, after you pass the Emergency entrance. Valet services are available from 6:30 a.m.-7 p.m. M-F, and 7 a.m. to 5 p.m. on weekends, for $5. Motorized scooters are also available for loan, at this entrance. Self parking is available 24 hours a day at the P2 structure for $2, with a validated ticket. If you have questions, or need additional information, please contact the U-M Department of Urology at (734) 232-4943.